ASUS is a well-known company that is famous all over the world for its innovative and high-quality products. Its product, the ASUS VG248QE, is one of the first 144Hz gaming monitors that was manufactured in the world. It revolutionised the gaming industry due to its strong pixel response time, minimum input lag, good pixel overdrive settings, and an affordable price. From then, ASUS has been continuously producing outstanding and unique gaming products to cater to the demands of the users. Here is the review of another great monitor by ASUS, the ROG Swift PG248Q. The ROG Swift PG248Q has a smooth dark gray plastic body and design along with a slim bezel. The ergonomically-designed stand is larger in size than other ASUS monitors, which is a benefit as it holds the screen firmly. Apart from that, there is a five-way small joystick place right at the back so that users can get easy and quick access for navigating the on-screen menus and shortcuts. The overall design is plain. It is almost like its predecessor, the MG248Q. However, it doesn’t have the same amount of red at the rear and on the stand. Moreover, the funky random lines and patterns of the MG248Q have also been eliminated. Other than that, both products have a similar look. As this device is mainly designed for endless gaming sessions, the stand allows users to change the position of the screen in any way they like. Gamers can adjust the height of the screen as well as pivot, swivel, and tilt so that they can find an optimal viewing position whether they are sitting on the bed, couch, sofa, or anywhere else. Furthermore, it has a 24-inch screen with a TN panel cable of a 1ms response time, which is perfect for gamers. It has a resolution of 1080p that helps deliver bright and excellent picture quality with impressive details. It also comes with two USB 3.0 ports, DisplayPort, and HDMI inputs. The ROG SWIFT PG248Q delivers high performance due to its remarkable features. 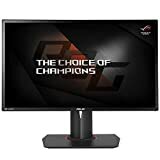 As it is made especially for gamers, it boasts an ultrafast 1ms response time, which means that it permits the pixels to change their colors as quickly as possible for avoiding ghosting, streaking, and blurring in fast-moving video games. Moreover, it has a 24-inch widescreen anti-glare flat-panel LED monitor that provides clear images and a large viewing area. That’s not all, as the GSync technology eliminates image tearing and reduces input lag and display stutter. Also, it provides a 160-degree vertical and 170-degree horizontal viewing angles to ensure a proper display of the picture from multiple perspectives. It is one of the cheapest GSync displays available in the market. It has a minimalist design, but it is sturdy and robust. It possesses an exceptional 180Hz refresh rate. It has a 24-inch display, which could’ve been bigger. As people are now going towards larger screens, a 24-inch screen size might repel some buyers. The Asus ROG SWIFT PG248Q is a 3D enabled monitor with superior performance. Produced by Asus, the monitor has a good build quality and you simply cannot go wrong with an all around respected brand.